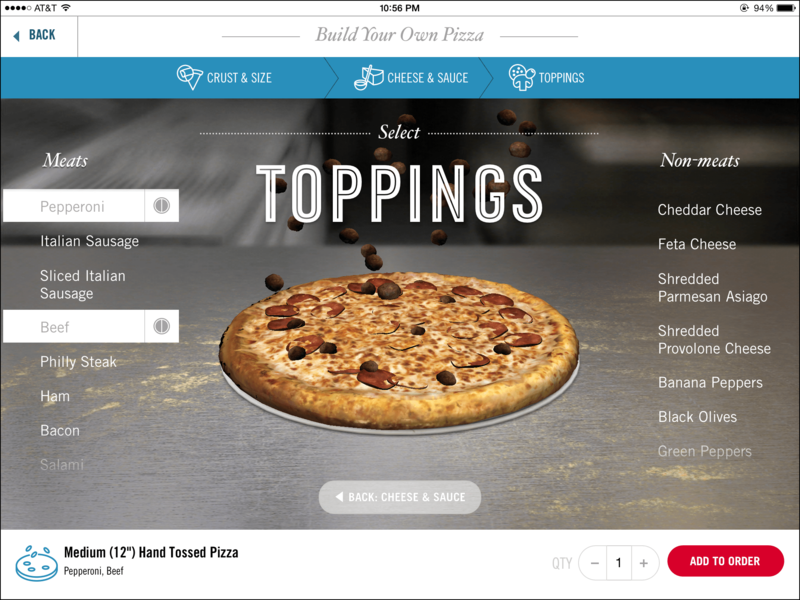 Domino’s revealed its latest update for the iPad last week, and unlike most app updates, this one had a press release. The updated software now includes a realistic 3D Pizza Builder photo animation that lets you build your pie from the crust up. The app depicts your dinner as a work in progress as you tap through your order, from picking a crust style to the showers of toppings raining down as you crown your achievement with meatballs and banana peppers. The high-rez food photography is brilliant and (at least for the waistline) evil. Those tasty-looking pizza pictures will probably inspire a few customers to tap the back button and increase the size of their pizza, add more toppings or experiment with various combinations they wouldn’t normally consider. As with previous versions of the Domino’s app for Android, iOS and Kindle, as well as its website, you can use the Domino’s Tracker progress bar to follow your order as it gets made, baked, boxed up and delivered. 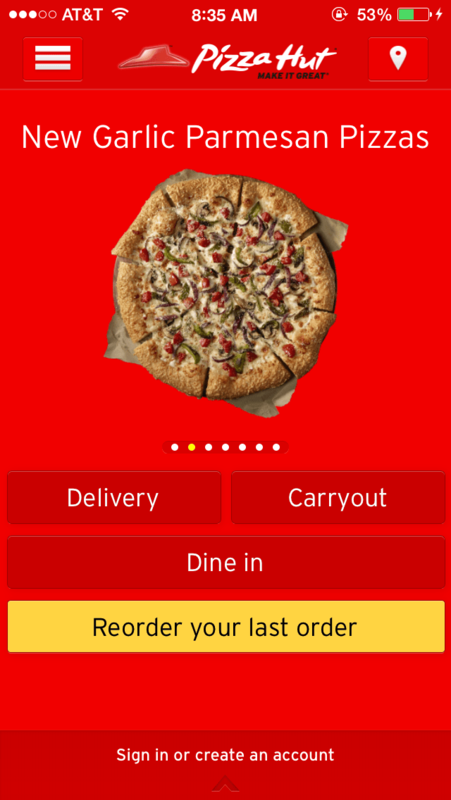 But Domino’s is not the only national pizza chain with its own app. 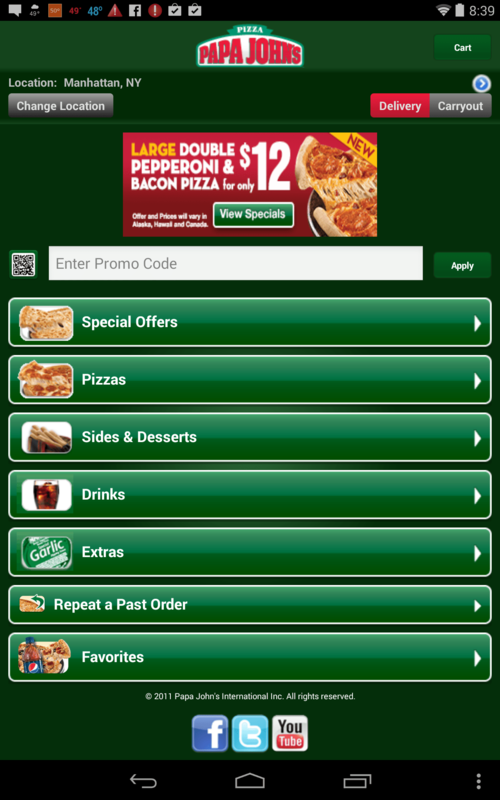 Papa John’s has Android and iOS apps to complement its mobile website. With the apps, you can tap together your order (which has its own pizza pictures), set certain pizza combinations aside as repeatable favorites for even faster ordering — and pay by credit card through the phone. Don’t forget Pizza Hut, which made headlines a few months ago with its prototype pizza-ordering table. The Hut has its own mobile apps for iPhone, iPad, Android and Windows Phone. You can also get an app for your Xbox 360, although TiVo beat the Xbox by about five or six years when it came to ordering pizza through the TV. The dedicated mobile apps usually offer more streamlined experiences than just using the mobile web on your phone, and can do other things like send push alerts for coupons and special offers. According to The Wall Street Journal, about 40 percent of Domino’s sales come from online ordering, so there is a significant user base driving the digital delivery. But are you one of those pizza purists who dislikes the somewhat-predictable taste of national chain pizza? (Yes, New Yorkers, we are talking to you.) If your preferred local pizza joint does not have its own app or site where you can place your order, see if you can find them on Seamless or GrubHub, sites that provide online ordering from a huge directory of restaurants in cities across the country. You may be able to get your favorite order sent right to your door — all without having to spell your name on the phone or actually talk to anybody but the delivery person. It was a busy week for cyber-hijinks. Take, for example, the Associated Press’s official Twitter account getting hacked earlier this week with the message “Breaking: Two Explosions in the White House and Barack Obama is injured.” (Oh, for those simpler days when intruders would just post the word “Poopin’” on invaded Twitter accounts.) Verizon’s 2013 Data Breach Investigations Report found a lot of corporate espionage and that state-sponsored cyber attacks have become much more prevalent. LG Electronics has an event planned for early May in New York City and where it’s expected to announce the US arrival of its Optimus G Pro smartphone with SmartVideo eye recognition technology. And a code-reader looking at the Android app that comes with the new Google Glass spectacles claims to have found a few lines referring to eye gestures as a way of controlling the glasses. In mobile news, the popular visual blogging site, Tumblr, has rolled out advertisements for is Android and iOS mobile apps. iTunes users will also be happy to know Apple has added an option to download large purchases later if you buy new music or video over a flimsy data network connection, you now get the option to defer the actually download until you’re home on your zippy WiFi network. And Yahoo has released a new app for iOS devices that has already incorporated summaries from the Summly service it bought a month ago for $30 million dollars. Video fans have helped Netflix bounce back from kerfuffles over its pricing plans and other issues to beat HBO in terms of total number of subscribers in America. Netflix has also been crowned the biggest bandwidth hog, chewing up 33% of downstream Internet traffic. And those who occasionally switch over the AV input to play a little Xbox can now order a pizza through the game console, as Microsoft and Pizza Hut have teamed up on an Xbox Live dashboard app that lets you order a pie with your game controller or Kinect motion sensor. Wave your arms and a pizza eventually appears…yeah, life is good. J.D. shares tips on how to independently publish your own e-books and Pedro test drives some tablet and smartphone stylus pens. 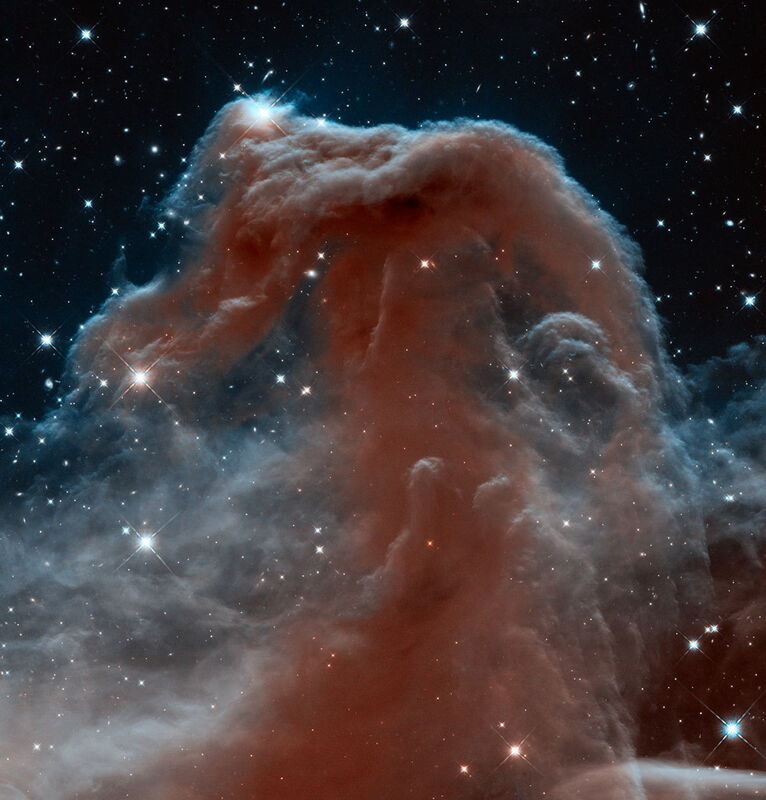 In the news the Associated Press has their Twitter account hacked; corporate espionage appears to be on the rise; Google Glass buzz heats up; and the Hubble Telescope celebrates its 23rd birthday.